Cowgirl decor is ideal for a country kitchen but sometimes it is difficult to find dinnerware that it is picture perfect. You may find some dinnerware is attractive but sometimes it looks a little bit too manly when compared the rest of the décor. Cowgirls often decorate in princess suited colors like pink, purple or turquoise, with a little bit of brown, black, silver, or gold. That can make for a difficult combination to find accenting dinnerware. 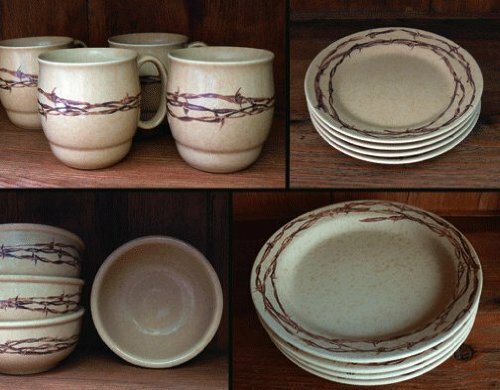 Western dinnerware often displays horses, brands, broncs, longhorn cows, and so forth, while cowgirl décor features horses, crosses, stars, barbwire, and such. At any rate, you can find country dinnerware that can make your kitchen décor eye-catching. Sometimes floral dinnerware will make good accents to the décor. I have also seen bandana patterns in various colors that might fit into your cowgirl theme. Western shops and tractor supply stores occasionally carry dinnerware, so that's a good place to look for dinnerware to coordinate with cowgirl style décor. I have seen rodeo style dinnerware that includes patterns with cowgirls barrel racing in specialty shops. If you are creative and crafty, you can actually make your own ceramic dinnerware using Ceramic Transfer Printing. Then you can handpick your colors and prints. If you choose to do that, be sure to use food-safe glaze and to get the ceramics fired properly. If all else fails, you can always go with colored dinnerware in solid colors or two-tone colors. That is always an option with hard-to-match décor. Ideas are best developed from pictures. If you have found the perfect dinnerware for your décor, or if you are still looking and would like some ideas, post a picture or descriptions of your cowgirl theme. 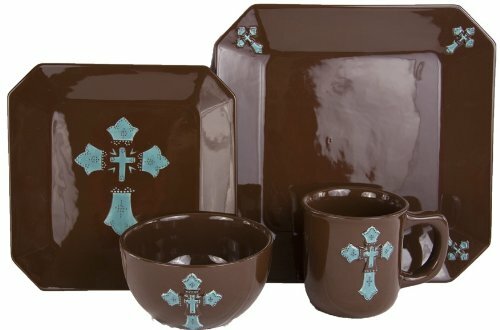 I would be happy to look for dinnerware for you and most likely, guests to this site will share ideas as well. Decorating cowgirl style is a lot of fun. Shopping for treasures is all a part of it. I love to view decorating ideas and to contribute to them as much as I can. Country, western and rustic décor themes are my favorites. I look forward to seeing your creation and contributing ideas for it.